Here is an example of a guided math lesson that works on composing and decomposing numbers 11-19. I’m also going to lay out the flow of what the entire lesson looks like when I am meeting with my kinders in the “teacher” zone… which is what I call myself as a center during guided math. This is my general outline or “flow” that we follow. Despite the name, my kinders can always start without me. 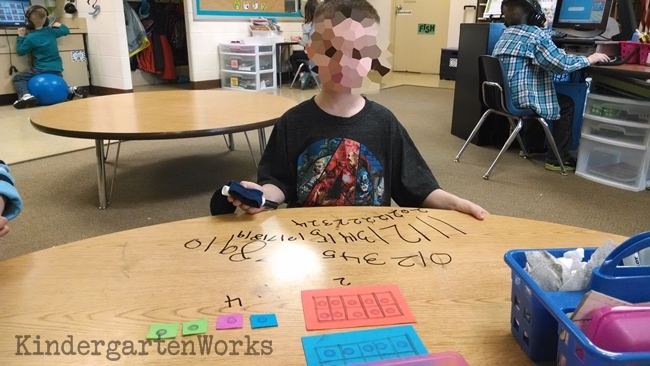 If I am needed across the room, or am following up with assessing a student from the previous group, they simply get out a box of dry erase markers (in our group’s basket) and begin working on writing their numbers. Sometimes just having one minute to review my lesson plan again and switching mental gears is just what I need. My highest group each have a post-it in their groups’ box that holds the last highest number they wrote to. Their goal is to continuing on writing as high as they can starting at their last recorded number and record their new number when time is done. We start out with a whole group warm-up. Normally this is counting, and each group has their own goals. 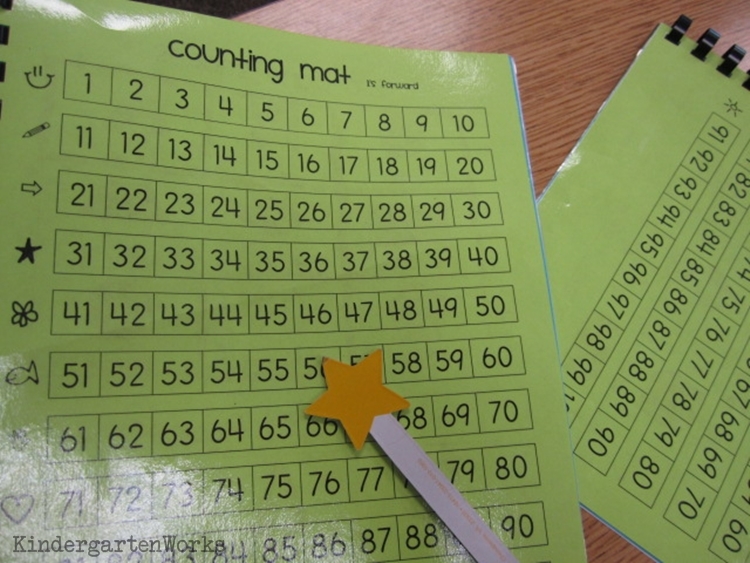 I love having these FREE counting mats from Melissa and I ran some of her math mats double-sided, laminated and bound each one to make a booklet. I plan on revamping them to be more kinder-friendly in the future, but they work great for now. 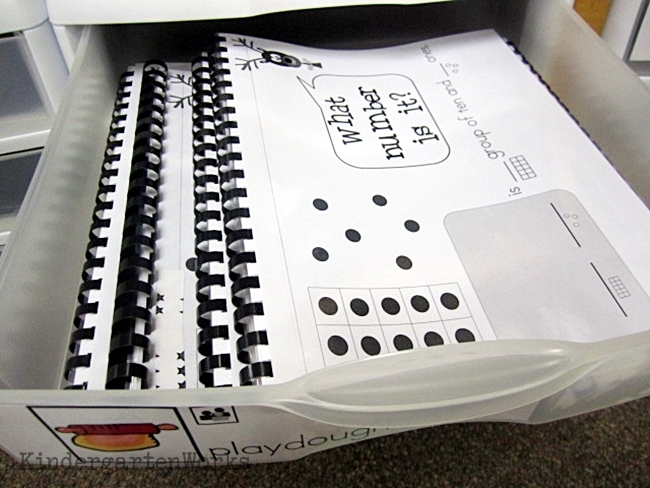 I have 7 booklets – one for each student and one for me to model. I copied each page onto a different color to make giving directions easier. After the warm up we launch into the main math activity. I plan about 15-20 mins worth of an activity and always tie it to a math strategy or two. When introducing, I begin by sharing what strategies we are going to try or by having a student explain what the strategy means (if we’ve already tried the activity before). This quarter we are focusing on composing and decomposing numbers 11-19 using a group of ten and ones. It allows us to also practice more standards (11-19 identification, writing numbers 11-19). 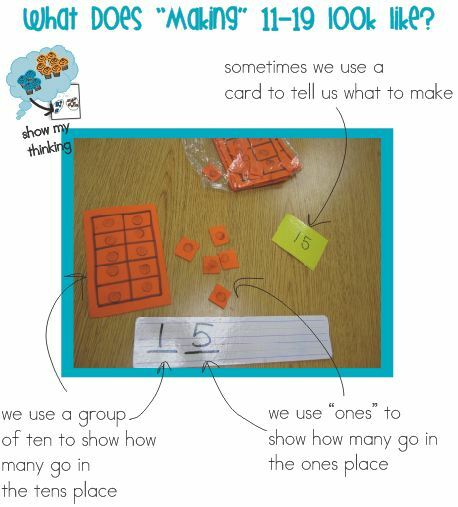 We are also using tools to “show my thinking” (math strategy) when we are used to using pictures and numbers to show our thinking. So I introduce the materials needed to show our thinking about teen numbers. The first time we did the activity, we modeled writing a “teen” in the tens place and talked about the connection between all the teen numbers. We used number cards and foam groups of ten and ones to make 11-19. Our first time we probably made only 3-4 numbers during our group time. With my lowest group, we only focused on the 11-15 range and I had the materials in front of me (the first time through) as they helped manipulate them whole group. The second time we revisited this activity, my highest group started out with teens and we quickly moved into making numbers 11-99. They pulled higher number cards and worked with a partner. Partners in small groups is so powerful. They are great at working together, checking each other’s work and staying on task. For my other groups, we worked our way into partner work and then independent practice. To make it “feel” like a game, a partner would pull a number card (so I had one set of cards for each partnership) the other one would make it and the first would check the making and writing of it. I think we had done this activity three times before everyone had a great grasp of it! While students are working, I am always referring to the strategy that I laid out on the table before we began. When we go to transition out, I refer back to what strategy we practiced and how it applied (I’d review the song for example) as they are cleaning up their materials. We wrap up by focusing on a different standard that can be practiced in bite-size chunks. Currently, we are getting lots of practice making our teen numbers using playdough in the last five minutes before its time to switch groups. My second to highest group is exploring what new number they make when I direct them to move it to the tens place, and ask, “What is 7’s ten name?” So they have fun taking 17 making it into 71 and then back again. This exploration is keeping them on their toes. My highest group has made teens and twenties and are now moving into thirties. They are also enjoying changing the numbers in the tens place. 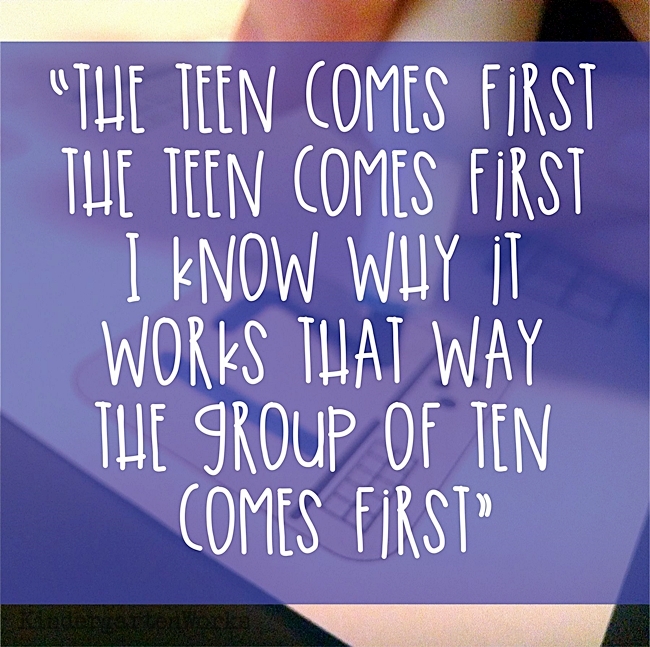 My lowest group is working on just identifying those teen numbers and recalling their form. That’s where we’ve been spending some time over the first 3-4 weeks of our second quarter. For now, this format and flow works for us. I’ve made lots of tweaks so far this year and am growing in the way that I use our guided math groups. I’m genuinely thankful that I am stretching myself as a teacher in new ways that meet my kinders’ needs. I love being able to share my ideas, thoughts and more here as I continue in the process. This skill ends up being huge in mastering numbers to 100 and beyond. 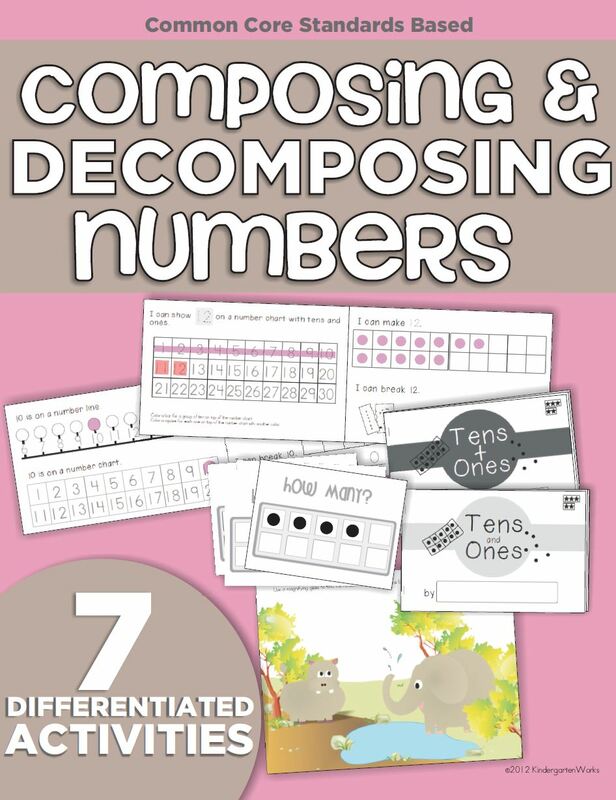 If you want to brush up on this specific standard, be sure to check out a three part series that dives into everything you could want to know about decomposing and composing numbers in kindergarten. Take my best-selling item on composing and decomposing numbers to help your kinders master this skill. What tips do you have for creating a lesson flow that works for you? Leslie, did you include anything else in your warm up booklet? I love the idea- especially on days when other groups need a quick run down of the directions. Oh sorry, in my previous comment I mentioned your link didn’t work. I just went back and the link worked. Must have been my connection! Sorry and thanks again! You’re very welcome and I’m so glad that it was helpful to you and your daughter. Thank you for taking the time to share!